Nippon Seisen's screw wire boasts superior headability due to its wide variety of steel types and highly adhesive coating. Also, we can respond to our customers' demands with exclusive steel types and high-alloys for high strength, high heat resistance, and nonconductive applications. 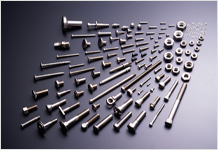 Nippon Seisen has a wide variety of heat resistant screw materials, from stainless steel types and our signature heat resistant steel (SUH660) to high-alloys, thus making it possible to manufacture screws and bolts capable of dealing with all sorts of temperature levels. We offer three types of high strength screw wire: an austenite type, a precipitation hardening type, and a conventional hardening type, enabling customers to select a type depending on their needs. The consistent workability as well as the hardness following screw rolling enables manufacturing of screws with hard ridges. Hardness is increased by heat treating after cold working. Corrosion resistance is better than standard Cr type screw materials. We have greatly increased the strength and corrosion resistance compared to the previous conventional hardening type screw material, SUS410. Nippon Seisen's NAS304FM is a material well-suited to combined machining, putting together good headability and machinability.